Long Beach, Calif. – September 14, 2011 – Formula DRIFT prepares for what many are anticipating as the largest event in Formula Drift history with the finale at the Toyota Speedway at Irwindale. Round 7: Title Fight ending one of the most exciting seasons to date on October 7-8. Tickets are on-sale now. 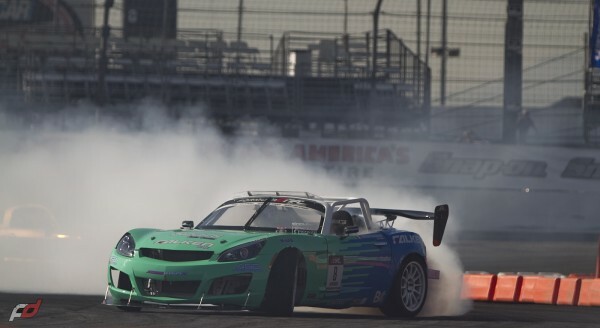 Along with the purchase of tickets, Formula DRIFT will be holding a contest for all pre-sale ticket buyers. – Twenty five (25) individuals will receive one (1) Trident mobile phone or iPad case each. – One (1) individual will receive a set of four (4) Enkei Fujin wheels plus one (1) set of matching Nitto Tires. – One (1) individual will receive two (2) tickets to the Formula DRIFT Awards Banquet being held on October 9, 2011 with one (1) night hotel stay at the official banquet hotel. Winner must be 18 or older to qualify. – One (1) individual will receive an $800 credit toward any set of Falken Tires redeemable at any America’s Tire / Discount Tire location. Labor costs not included. 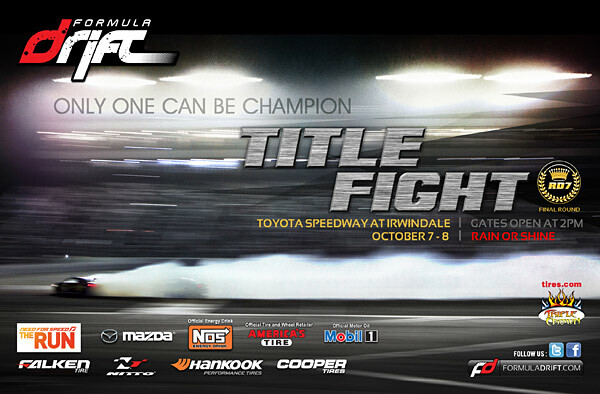 Winners will be announced on September 26 on the Formula DRIFT website, www.formuladrift.com. Prizes have no cash value. More prizes to be announced at a later date. Each ticket purchased counts as one raffle ticket. Tickets are available for Round 7: Title Fight on October 7-8, including reserved seating, 2-day ticket packages, and VIP tickets. Tickets can be purchased through www.formuladrift.com. Ticket prices start at $26 online.